The anime film featuring the SOS Brigade is bound for Blu-ray this September. In an early announcement to retailers, Bandai Entertainment is prepping 'The Disappearance of Haruhi Suzumiya' for Blu-ray on September 20. The release will be a Blu-ray/DVD Combo Pack with Dolby TrueHD 5.1 soundtracks and supplements will include numerous featurettes, ASOS Brigade episode, and teasers, trailers, and commercials. 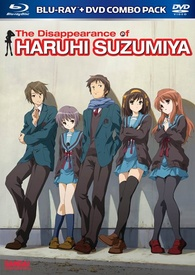 You can find the latest specs for 'The Disappearance of Haruhi Suzumiya' linked from our Blu-ray Release Schedule, where it's indexed under September 20.